In our young days the fish vendors would come cycling down the street early morning, howling at the top of the voice mathiye mathi… roopakku aaru (Sardines, Sardines – six for a rupee). One of the women from the household would go to the street on hearing his calling and the vendor would dismount. Putting the cycle laden with the heavy fish-basket on the rear carrier gingerly on its stand would commence the procedure. It would begin with ascertaining the freshness of the fish, the type of fish and the price. The lady would most often complain that the fish he sold last time was not all that fresh as the vendor would have claimed. After exchanging a few bargaining words, the price would be settled and the vendor would count out fish as demanded. Sometimes the men would also go out to the road to purchase the fish. After our eldest brother turned a teen, it became his duty every alternate morning to buy the fish. As we all grew up, everyone took turns. During my vacations from boarding school, I was entrusted the duty for the two months. Whenever I bought the fish, Amma would always compliment me for the ‘deal’ I clinched from the fish vendor. Our eldest brother became suspicious of my ‘deal’ and one day he asked me the secret behind it. I told him that I would tell Amma not the actual price I paid, but half a rupee or a quarter less. He then wanted to know as to how I managed the balance change and I told him that the few coins I saved up from my pocket money at school was used for this. If I could gather a few brownie points over my brothers and above all if I could make Amma feel pleased, it was worth it, I thought. We generally bought fish every alternate day as we all liked a day old fish curry. It was only with the a day of ageing that the kodampuli, a specific type of tamarind from the Malabar region in Kerala, would soak into the soft flaky flesh of the fish from the backwaters of the Arabian coast… and that is also when all the spices let out their combined aromas. The day after, the fish curry with steaming hot fresh puzhungarisi choru, boiled ‘boiled’–rice, tastes truly like it was made for God, in his own country, none the less! After our father’s retirement, he would rise early, clear the fallen leaves in the courtyard and await the fish vendor. We never had any particular vendor, but would buy the fish from the one who arrived first. One day Thankachan came with the fish and our father bought some from him. Again after two days it was Thankachan who sold fish to our father. Promptly, Thankachan appeared on our doorsteps the next day requesting our father to buy fish. My father explained to him that we bought fish only on alternate days. Now Thankachan narrated his story. Thankachan had been into the fish vending business for the past two years and not even one day he could sell off all his fish. At the end of the day he would sell all the remaining fish in the basket to the Toddy Shop at half price and this always ate into his earnings. Our father was his very first customer for the two days and on both the days his basket was empty by noon. That was why he did not sell any fish to anyone on his way from the market to our home and wanted our father as his first customer, being a good omen. From that day we bought fish every morning and Thankachan would give us a good deal, but always made sure that he received the payment only from our father. This customer relationship continued for the next ten years until Thankachan called it a day from his business of door-to-door fish vending. Many vendors in India still feel that the business for the day would depend on the first sale they execute and the day will go well only in case the first customer is a lucky person for the vendor. The vendors hate when the first customer wants credit and some even refuse such customers or in case it is unavoidable, would request them to come after an hour. 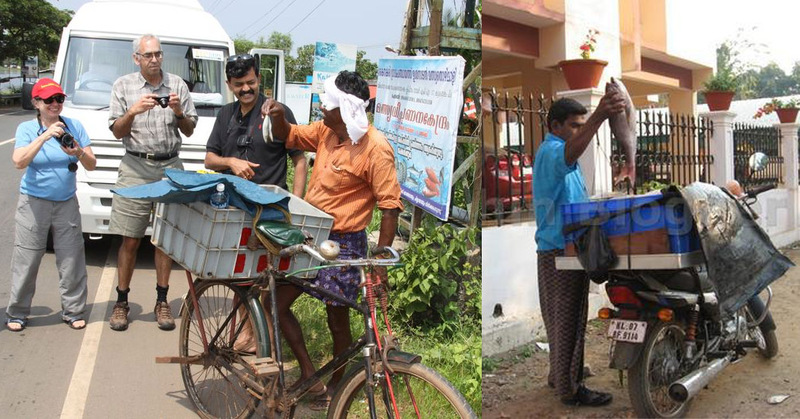 With the changing times, development and prosperity setting in Kerala, where in all the strata of the society prospered together, the fish vendors discarded their bicycles for motor-bikes. Now they do not howl at the top of their voices, but would text preferred customers the details of the type of fish and the price and the interested customers would confirm by a return text message. Once they got confirmation for their entire stock, then only will they set out on their bikes from the market. The days of the haggling fish vendor has now been confined to history.